I know every human being was given a gift, a gift from heaven. I know everyone busy for welcoming Pope Francis. I think more than the visit, we should reflect and think of his message. Pope Francis was given a wonderful gift to touch every person lives and bring the message of love. Last Sunday, I was at the Vatican City with my sister and Lynda Jumilla before Pope Francis Angelus and his asking for prayers for his visit in Sri Lanka and Philippines. There will only be few people that will be able to touch by his hands but more than anything else, we should understand that his bringing the love and care to Filipinos especially those victims by Typhoon Yolanda. I'm hoping that everything will go smoothly with his visit, the security, the mass, and that the government will continue working hard not only during the Pope's visit. What about you? What are the gifts that you could share? Are you using your gifts to highest potential? Welcome Pope Francis to the Philippines. P.S. 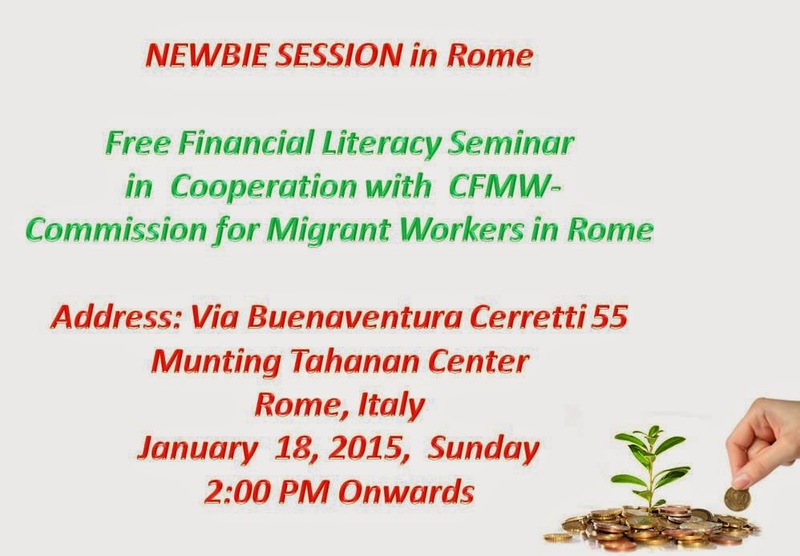 I will be sharing my gift on Financial literacy to Pinoys in Rome this coming Sunday,feel free to come.